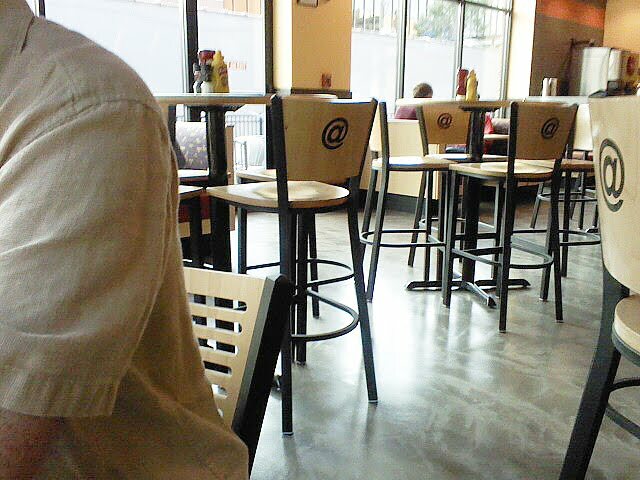 We gave @burger, Big Boy’s pilot attempt at a hip burger joint in downtown Ann Arbor, a shot this past weekend. I’m afraid I wasn’t very impressed. It wasn’t terrible, but it wasn’t memorable either. The interior is loud and boomy, even with only a few people. There were only a few booths and mostly high-top bar style tables, the rest of the seating was a few scattered lower tables and the placement is really tight. Ordering is a bit awkward because the digital screens with the menu are at an angle to your right and away from the person you’re giving your order to. It might make more sense to have the menu directly behind the counter. I had a ‘small appetite’ beef burger off their create-your-own burger menu, which they call a ‘Made for Me’. 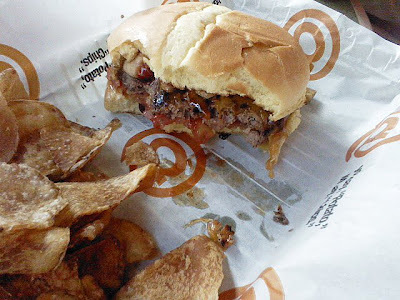 The toppings I added were what I normally have at similar burger places such as, Great Plains Burger Company and Bagger Dave’s: BBQ sauce, tomato, cheddar and sauteed mushrooms. They only have one hamburger bun which they refer to as a ‘brioche bun’. All burgers come standard with house made potato chips. I tried to “upgrade” my potato chips to their ‘bruschetta chips’ with tomatoes, basil, garlic, olive oil and parmasen cheese, but it would have been an extra $4, too rich for my blood, so I just went with the plain chips. @burger’s self-proclaimed “soon to be famous” brioche bun was oddly dense and I just couldn’t get used to it. After reviewing a number of burgers on my blog I’ve finally come to the conclusion that I’m a pretty strict traditionalist when it comes to a hamburger bun. The bread can be wheat or white, but the texture has to be simple and soft, nothing else will do. The burger itself was okay, but nothing special. Their signature barbecue sauce had a nice smokey flavor. The mushrooms were cut a little too thick, but were nice and garlicky. Their freshly made potato chips were a disappointment. They were incredibly oily in taste and overdone. I’m glad I didn’t pay extra for the upgrade. Given the loud awkward atmosphere and lackluster food, I can’t say that I see myself coming back. It’s not often I look to a hotel restaurant for a good lunch, but that’s just what you’ll get at 5ive Restaurant inside the luxury hotel and golf course at The Inn at St. John’s. 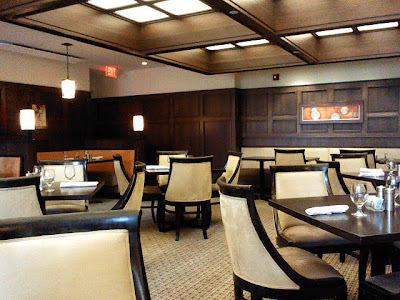 My husband and I first tried 5ive last year for my birthday dinner and really enjoyed the food and friendly service. I though it would be fun to give their lunch a try last weekend. They were not particularly busy on the Saturday afternoon we stopped in, but I’m not sure they’re normally very full. They were also pretty quiet last year when we had dinner here, so it may just be the nature of an out-of-the-way hotel restaurant. Their summer lunch menu has a variety of flatbread pizzas, salads, sandwiches and lighter entrees. I ordered the steak panini on the recommendation of the waitress. The panini had slices of grilled steak, boursin cheese, chipotle mayo and normally caramelized onions, which I chose to omit. It came with house french fries and sweet and sour pickles on the side. As a warning, the prices for their lunch menu that are currently online are a couple of dollars less than what we saw on the menu when we arrived at the restaurant. 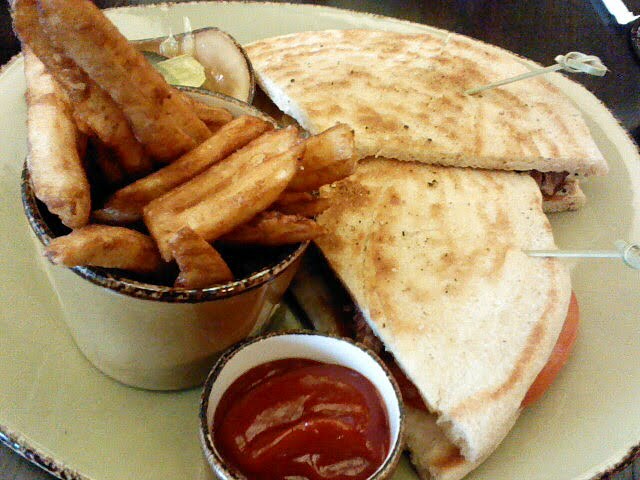 My grilled steak panini was really good. I was a little concerned that the combination of boursin cheese with the chipotle mayo might be a bit to heavy, but it wasn’t. The chipotle mayo gave the sandwich just enough of a kick in flavor. The portion size was pretty substantial, too. The fries were decent, but traditional in style and flavor. The sweet and sour pickles were tasty and I couldn’t stop eating them! Service at 5ive is very friendly and attentive. The food is really good, but maybe a bit overpriced; however, not too surprising at a boutique hotel restaurant. I thought the cost for the dinner entrees (about $18-$33) were more reasonable overall than the lunch entree prices (about $15-$24). Though both the lunch and dinner entrees include a choice of soup or salad. It’s a nice slightly lower priced and quieter alternative to a number of high end downtown Ann Arbor restaurants that are usually crowded and difficult to have a conversation in. It’s unlikely that you would know that Innovation Cafe exists, even if you live in Plymouth. It’s hidden inside the Michigan Life Science and Innovation Center building in an industrial park off of Beck and M-14. I have to thank a Yelp reviewer for the tip on this one. I was looking for new places to eat in Plymouth and came across a single review of Innovation Cafe from someone who works nearby. The review by BD Traveler R. was intriguing enough for me to make the trip out there. I also scoped out their website menu ahead of time and it sounded interesting for a weekday lunch. The cafe is run by chefs who own a catering business. The cafe appears to be side business as the hours of Innovation Cafe are a little short, only 11am-1pm Monday through Friday. I grabbed an adventurous friend and headed up last week on a Tuesday. The setup is cafeteria style, but the sandwich and entree choices offer more than you might expect from a corporate cafeteria, including sushi, a salad bar and several interesting sandwich options. Tuesday is also ‘Stir-fry Day’, it was beef and broccoli the day we went. 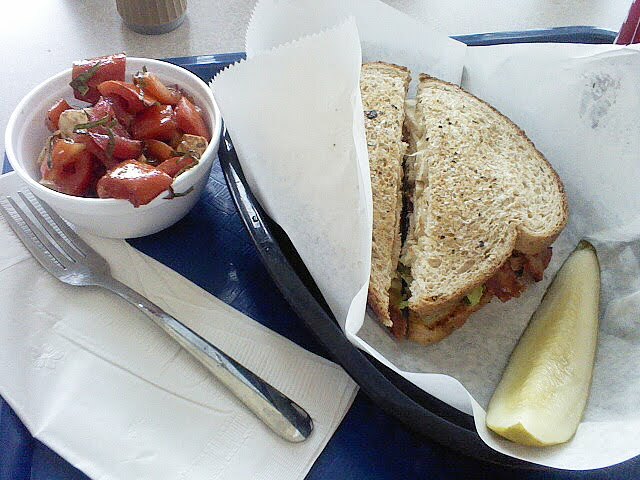 It smelled tasty, but not being a broccoli fan I went with the Innovation Club sandwich which had grilled marinated chicken, black pepper bacon, romaine lettuce, tomato, Swiss cheese and aioli on freshly made bread. I also added their fresh caprese salad as a side. They surprised me by grilling the chicken and frying the bacon for the sandwich while I waited. I love pepper and there was plenty of it on my sandwich, though it might be a bit too much for some. All the ingredients were very fresh and flavorful. The caprese salad left a little bit to be desired. The tomatoes weren’t as flavorful as I would have hoped and the simple dressing was missing some pizazz too. My lunch also included a simple, but tasty pickle on the side. Overall I think it was a nice simple lunch and would be a great change of pace for local office workers looking for something that’s healthy and uses local ingredients. 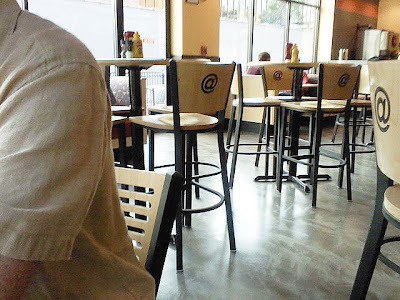 It’s a good alternative to fast food or chain restaurants in the area for a quick bite to eat. I don’t know that I’ll necessarily make a special trip out, but if I were nearby and wanted an easy cheap lunch I’d keep Innovation Cafe in mind. The prices are really reasonable and the chefs make a point of using local vendors and products which I make a point of trying to support. While we were out on the east side of town looking for a lunch spot we stumbled on this pretty tasty little place along Woodward in Royal Oak called, Vinsetta Grill. This restaurant seems to have a bit of an identity crisis. The decor is a mix of dark modern colors, contemporary architecture and limited lighting (in part why there are no photos for this entry), but there are odd collections of items on the walls such as a series of farmer-style hats that seem out of place. The menu is more traditional in style and choices than you would think from restaurant’s design. They also have a digital board near the kitchen that shows the current order numbers to let servers know when the food is up. It seems a little bit tacky for this type of restaurant since it’s not at Denny’s atmosphere. Aside from the decor our waiter was very helpful and attentive and the food was pretty good. We both chose to build our own burgers from a list of extensive toppings. I went with grilled chicken on a wheat bun topped with herb goat cheese spread, scallions, sun-dried tomatoes with a side of roasted garlic aioli. My husband chose a traditional beef burger with pineapple, Swiss cheese and barbecue sauce on a hamburger bun. The waiter was nice enough to suggest that we mix and match half orders of their sweet potato fries and regular fries and save a little money (the burgers are a la carte here). My “burger” was very flavorful. I’m always afraid that when I order a grilled chicken sandwich at a restaurant that the breast is going to be two inches thick and impossible to eat, but the one at Vinsetta’s was a much more reasonable half-inch thick with nice grill marks, though a just a tad overdone. The herbs in the goat cheese spread were nice and pronounced, but not too strong. The sun-dried tomatoes were still whole and a little tough to chew, they might consider cutting them into a julienne or cooking them a bit more to soften them up. The scallions and garlic aioli were delicious with the other toppings I chose. 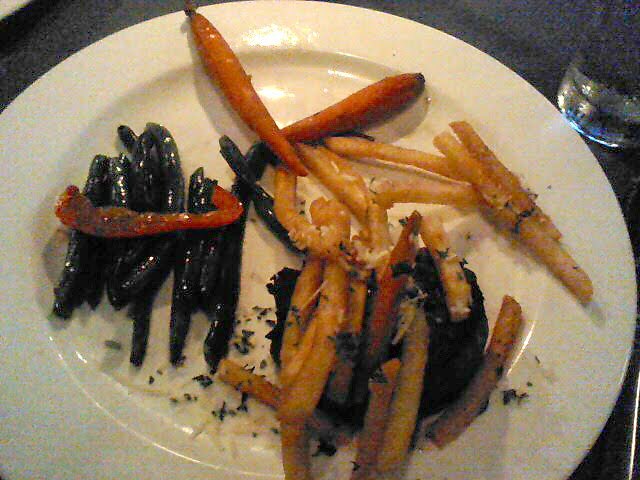 The sweet potato fries, which are one of my new weaknesses, were also yummy. Crispy outside and very soft potatoey (is that a word?) inside. We’re not on this side of the Detroit area very often, but if we were and I was looking for another interesting burger I’d try Vinsetta’s again. They have over 30 different topping choices so the combination possibilities are enough to bring me back for something less traditional.